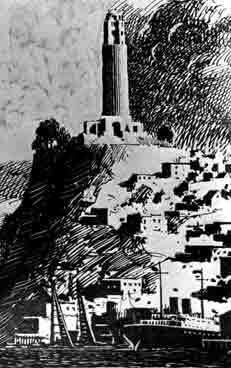 It is a matter of historical record that the Coit Tower art project was the prototype for the decade of the New Deal art that followed, 1933-43, halted finally by World War II. Utilizing carefully selected artistic talent, the project provided an iconography of the "American Scene" for the largest of all the art programs at that time, the Works Progress Administration's Federal Art Project (WPA-FAP) which followed a year after the PWAP. The themes of agriculture, education, urban and rural life, social protest, and New Deal Idealism established at Coit Tower were to become the subsequent subjects of those same artists and of others who took up paintbrushes and sculptors' tools under further government-sponsored art programs throughout the nation. Coit Tower was paid for with money left by Lillie Hitchcock Coit, a wealthy socialite who loved to chase fires in the early days of the city's history. Before December 1866, there was no city fire department, and fires in the city, which broke out regularly in the wooden buildings, were extinguished by several volunteer fire companies. Lillie Coit was one of the more eccentric characters in the history of North Beach and Telegraph Hill, smoking cigars and wearing trousers long before it was socially acceptable for women to do so. She was an avid gambler and often dressed like a man in order to gamble in the males-only establishments that dotted North Beach.